Competition in the graduate job market has risen dramatically over the last ten years, and students are increasingly looking for ways to differentiate themselves. An excellent way of doing this is by choosing an industrial placement as part of your degree course, which involves spending a year working in industry between your second and third years of study. Besides the money that you earn during this year, you also gain practical experience that can be invaluable both in your final-year project and when competing for graduate jobs. Students with industrial experience tend to not only improve their final degree performance, but also develop clearer ideas about their future career path. We appreciate that a year in industry can be a step into the unknown for many students and we provide help in both finding and vetting placements. Even when out on industrial placements, you remain very much part of the School, and there is regular contact between you and members of our academic and support staff. "Heading up recruitment for Electronic Arts, my job is to help grow and expand the games industry and attract the brightest and most creative graduates into EA. 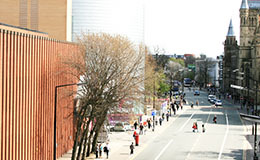 "Manchester is one of the leading universities, if not the leading university, for computer science in Europe today. "We have been consistently impressed with the graduates that we have taken on into full-time employment, not only for their academic ability, but also for their ability to think creatively and express themselves both in a team and as future leaders of this company. Computer games and interactive entertainment is one of the fastest-growing sectors in the world today." "If you want to get into a creative environment and work in one of today's most exciting industries, I cannot recommend highly enough studying at Manchester." The strength of the School's links with industry means that many of our students undertake placements in some of the most prestigious companies in the world. Companies who recruit our placement students include Credit Suisse, IBM, Google, Microsoft, GlaxoSmithKline, British Telecom, Accenture, Barclays Capital, Electronic Arts and Mercedes GP. "I am making the most of this incredible placement year; opportunities like this come once in a lifetime."